Charlie wanted to nurse while we were waiting for our food at Beach Chalet with my in-laws today. He was tired and hungry. I told him that the food was coming soon, but he insisted, I want to nurse, and was on the verge of crying. So I pulled out his muslin blanket, covered up, and breastfed him. I noticed our server looking at me. I wasn’t sure how to take it, and started feeling uncomfortable. So I just avoided eye contact with everyone, focused on patting Charlie, and imagined that maybe people would think I was just covering up my napping toddler. When she brought our food, she asked me, How old is the baby? I told her he was 2, and she told me that she has 2 kids of her own. I felt confused. This may not mean anything to you, but I just wanted to say that I commend you for extended breastfeeding. I did it with my kids and didn’t always get support, but it’s such an amazing bond, and you really are doing the best thing for him. That’s when I realized that what I saw in her face wasn’t disapproval but rather the working up of courage to give me the support and encouragement she knew I needed. I smiled and thanked her and almost started crying. Before we left, I made sure to thank her again and to let her know that she made my day, that what she said meant a lot to me. I am still processing just how much. Here’s the thing: I made the conscious choice to breastfeed Charlie until he decides he’s done. Making that choice doesn’t make extended breastfeeding easy. Sometimes, it’s frustrating. And when I nurse him in public, there are times that I feel so self-conscious, defensive even. By law, I have the right to breastfeed in public places. As a mother, it’s my decision whether to nurse (or not) and for how long (or short). But it’s wearing to get asked how long I plan on nursing/when I plan on stopping from so many directions. It’s especially wearing to be told that I should wean him already. And here’s the truth: I don’t breastfeed my son just because he’s allergic to cow’s milk. 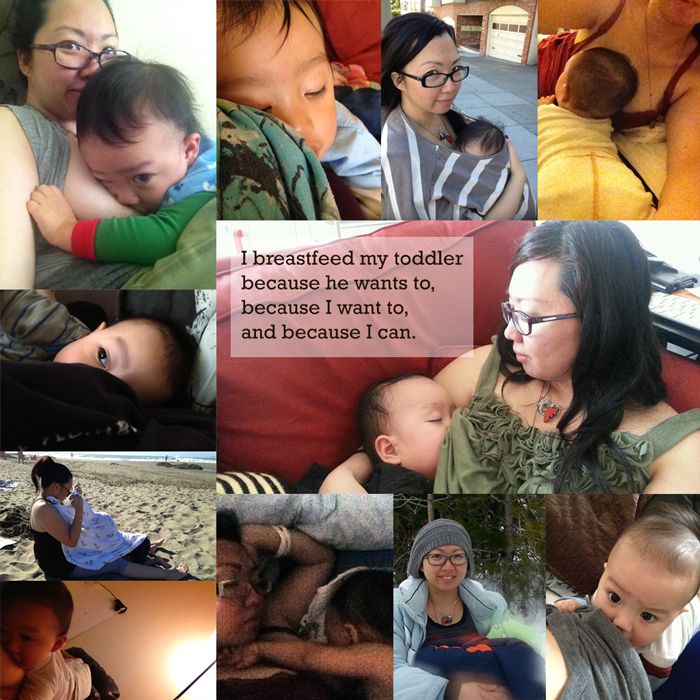 I breastfeed my son because of the nutrition and antibodies it provides him. I breastfeed my son because it comforts him and helps him fall asleep. I breastfeed my son because it’s one of the ways that we bond, especially during the work week. I breastfeed my son because it releases endorphins and oxytocin, which boost my own sense of well-being. I breastfeed my son because he wants to. I breastfeed my son because I want to. I breastfeed my son because I can.